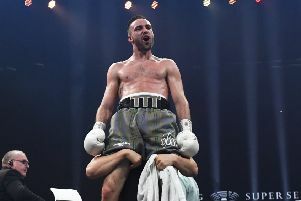 Light welterweight Josh Taylor says his days sweating in front of the TV cameras are now firmly behind him – apart from when he’s inside the ring doing what he does best. The 2014 Commonwealth Games gold medallist will step into the limelight tomorrow night when he boxes on the undercard of Carl Frampton’s unified WBA and IBF world super bantamweight title showdown with Scott Quigg at the Manchester Arena. Frenchman Lyes Chaibi stands in the way of the Prestonpans fighter’s fourth consecutive win as a paid boxer, Taylor having signed on the dotted line last summer with Cyclone promoter and former world champion featherweight Barry McGuigan. Although TV broadcast giants Sky Sports have devoted the last three months promoting what is being touted as Britian’s ‘fight of the year’ between Northern Irishman Frampton and Bury’s Quigg, Taylor knows this is an opportunity to showcase the raw talent that boxing legend Ken Buchanan believes will propel the former Lochend amateur to become Scotland’s next world champion. Admitting he has struggled in the past to deal with such exposure, Taylor says he has now learned to keep those demons at bay. Speaking from a Manchester restaurant with stablemate Frampton where the conversation was momentarily interrupted due to a doting fan asking for a picture, Taylor said: “I’m starting to relax more now and not getting as tongue twisted and as sweaty as I used to in front of the cameras which is a good thing! “I love what I am doing and getting paid to do what I’m doing. I’ve been to two Commonwealth Games and the Olympics with all the cameras but this will be an even bigger stage. I’m fine when I’m in the ring but it was all the stuff after I have had to learn to become better at. “I knew when I signed with the contract with Cyclone that Carl was world champion but I didn’t expect to be involved in such a massive event so early on in my career. Having had some of the sport’s biggest names to assist in his preparations for Chaibi bodes well for Taylor with Frampton, David Haye and George Groves all having passed on their wisdom to the aspiring Scot. “The buzz in the camp has been unbelievable,” Taylor said. “Carl is flying off the walls, big David Haye and George [Groves] have also got their fights coming up so it’s been great. After training we’ve been ribbing into each other so the camaraderie is brilliant. “I’ve been watching Carl and how he’s approached a fight of this magnitude. I’ve been taking it in and learning from it so I’m in a great position and extremely grateful for where I am. He’s in tremendous shape. He’s so focused so I think it’s going to be a spectacular night.